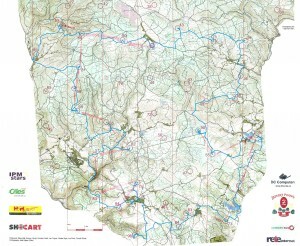 24 hours of looking for controls in the hilly Prebuz terrain just north of Karlovy Vary in the Czech republic. I participated in the 8-hour rogaining "Retki-rogaining" event near Viitapohja, Tampere, yesterday. 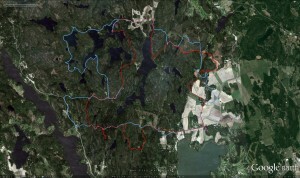 76: more roads to within 1k of the control, then through the woods on compass course to the road and lake close to the control. 41: north from the last control to a road. Ran about 100m in the wrong direction along the road, since we thought we'd found the road at the other side of an intersection. Close to the control we then searched for the correct hill slightly to the west of the right place. 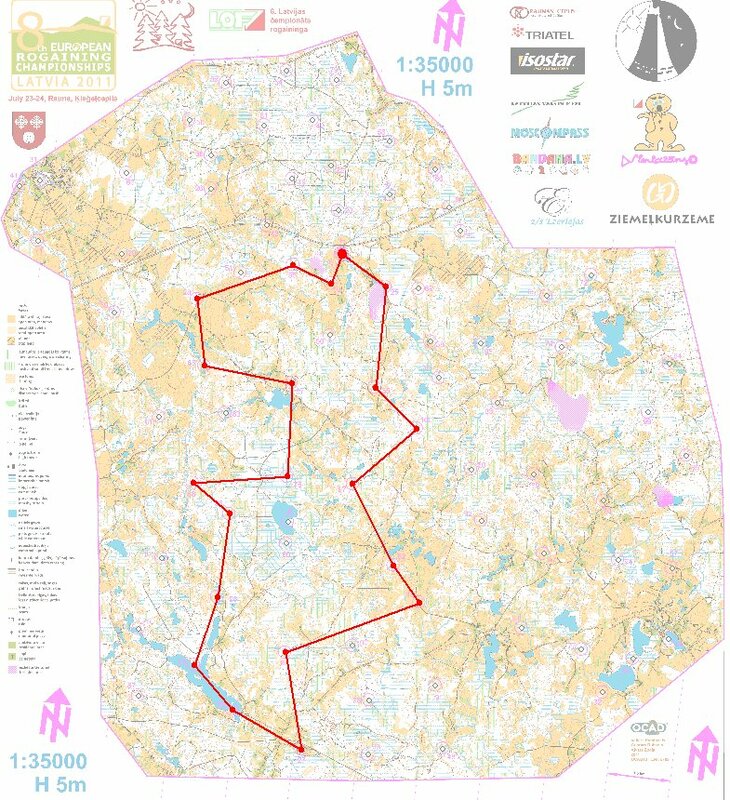 The only real orienteering mistake of the day here, costing maybe 10-15 min of time. 14: Along paths south to this water-control. 80: along a lakeside path. 54: south along paths and roads. Another small orienteering mistake as the plan was to take a straight path but we ended up on a more undulating and curving road (not much time lost however). 90: Very nice lakeside path to the control which was a small island with possibility for swimming, sauna, and grilling. 66: More paths along the lakeside, trying to use public roads and not to stumble onto other people's back-yards and homes. A lot of summer-houses and lakeside saunas here. By this control we had already used a lot of time and had around 2 hours left. It was clear that we would have to make our way more or less directly to the finish to get there in time. 48: Right after the control a mistake of maybe 100m when trying to find a path/road southward. An un-marked tractor-path then took us almost directly to the control. Some swamps with cloudberry ("lakka") here! 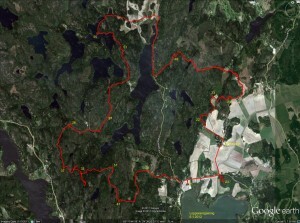 Finish: a fairly long bit along smaller roads at first and a bigger road later back to the finish. We punched-in at the finish with about 9 minutes to spare. The penalty for being late is -1 point for each minute of over-time, so it's important to be back at the finish within the time limit. My biggest problem was the heat. Most of the summer has been cold and rainy so I haven't done any long runs in warm weather. The graph below shows the temperature for Viitapohja, Tampere, with the 8h event taking place during the big peak with a maximum over +25C from 12:00 to 20:00. The wind and occasional splash of water from a lake provided some relief from the heat, but the graph still shows a sustained +23C or warmer for the whole event. From about half way through the event exhaustion from the heat meant walking, not running, up most hills. Towards the end I also walked quite a lot of flat bits. 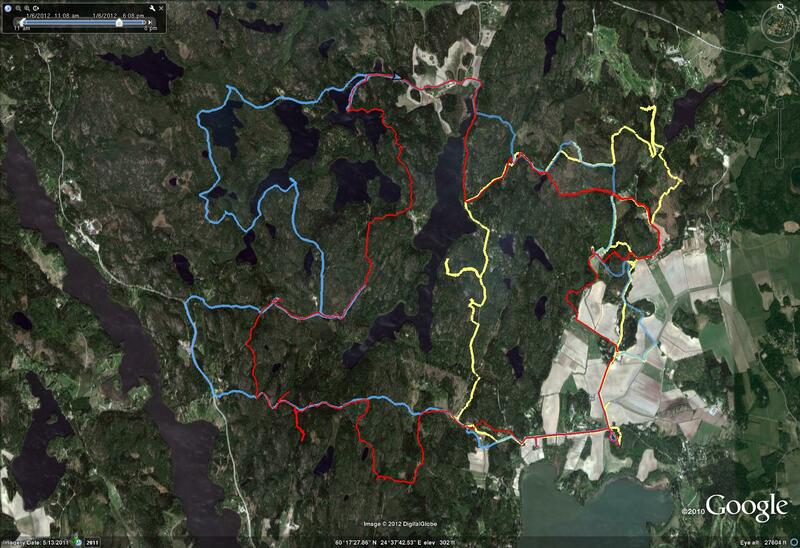 I got a few GPX-tracks from last Friday's rogaining event and drew them with OpenLayers. OpenLayers has a nice set of examples online. Browsing and copy/pasting from examples is much better than trying to read & understand formal documentation. 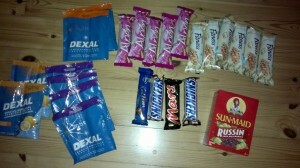 Took part in an 8h rogaining event yesterday. Very wet in the forest with a lot of fallen trees due to the storms over the last few weeks. We planned a ca. 20km long route (straight lines between controls), assuming we would walk up to 50% more, i.e. 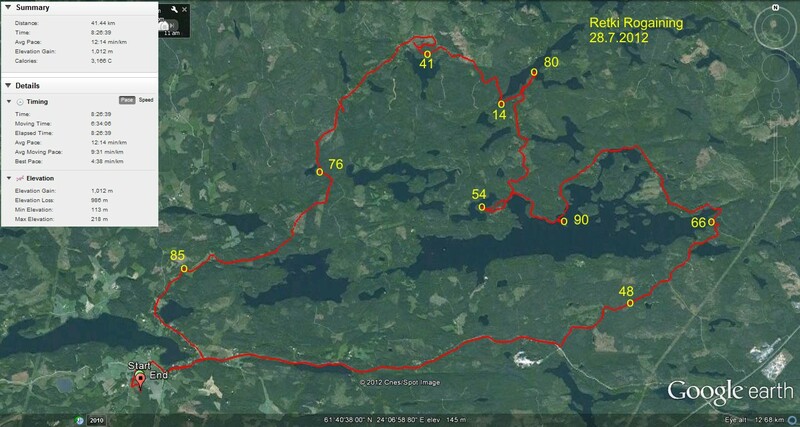 around 30km, which would be OK for 8 hours. This event had a 1:25000 map which was much easier to read compared to the 1:40000 one last fall. No problems in the beginning, we fould 23 -> 21 -> 31 -> 41 quite easily. The first digit of the control-numnber indicates how many points you get for the control. The next control 51 was worth five points, and they are usually harder to find. Not this time, since it was at the very top of a hill, and people before us had already left tracks in the snow. Then comes the big mistake of the day. We follow another faster group west down the hill from 51 towards 32. For some inexplicable reason we then completely mis-place ourselves on the map and although we are practically within reach of 32 we make a slow detour south before we realize where we are. Update: I have since learned that our confusion most probably was caused by a brand new road in this area, which was not marked on the map! Probably annoyed by the first mistake, the second mistake of the day comes on the very next control: between 32 and 37 we take the wrong path north-east and decide to head back when we realize that. So far we had stuck to the plan, but looking at the watch at 37 we decided to cut 39 from the route. Walk north along the road to 26, and then more walking along a big and then a small road to 57. At 57 we had some discussion about whether to walk back along the road, or try to find the electric lines north of 57 and let them guide us to the road. We had used 4 hours, or half of the total time here. We chose the latter route, and a straight northward pointing bit of our path after 57 indicates where we walked under the electric lines. Close to 53 the plan was to follow a path to the right of the hill and then the ditch to the control. Things didn't go to plan and we ended up to the left of the hill, but found the control with the help of tracks in the snow and voices/lights of others. A walk along the lake-shore to 55. And further north to a road. So far we had roughly followed the plan. But now we had less than 3 hours left, and it was already dark making orienteering in the woods without clear paths or roads much harder. We decided to forget the plan and walk mostly along roads towards the finish, taking controls close to roads/paths along the way. A long bit of walking first south and then northeast to 49. Another long bit of walking all the way to 24. 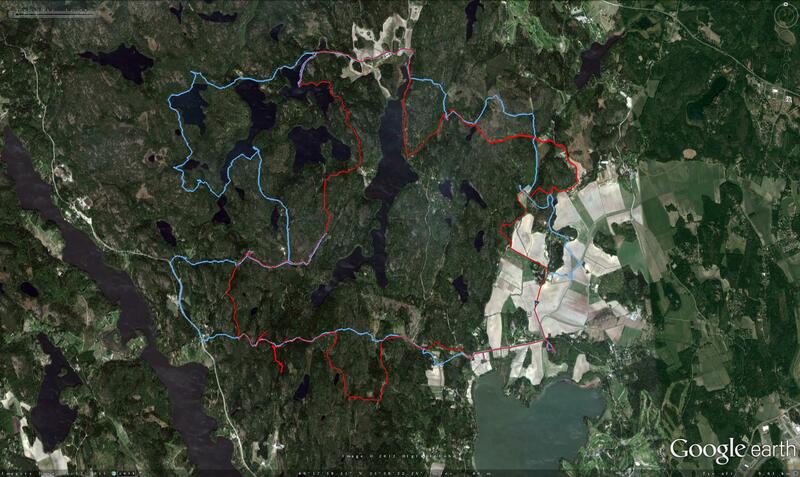 Here the image shows double GPS-paths because I switched from the 405cx watch to the Edge800 I use on the bike. We still had 45-50 minutes left at 24, so with a close eye on the clock we find 33 quite easily and 22 with a little more effort. We finished with about 12 minutes to spare. About 90 teams (either solo, or in teams of 2-4 persons) took part. Update: it seems both persons in our team got infected by Campylobacter from drinking some water from a local well. 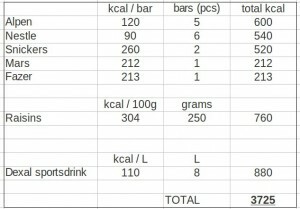 Lesson: use the water-purification tablets! 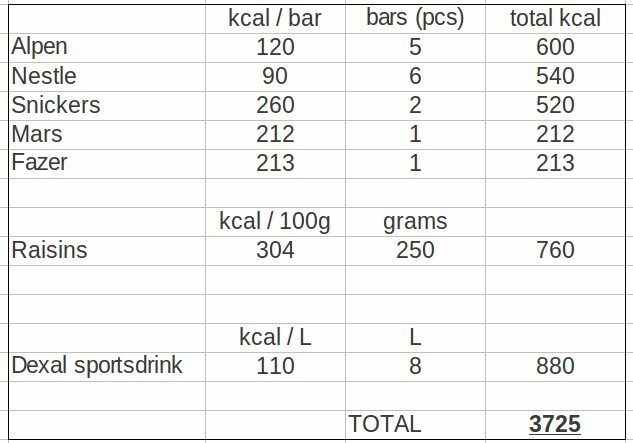 Is 3700 kcals enough energy for a 24-hour hiking/orienteering event? My first ever 12h rogaining event. 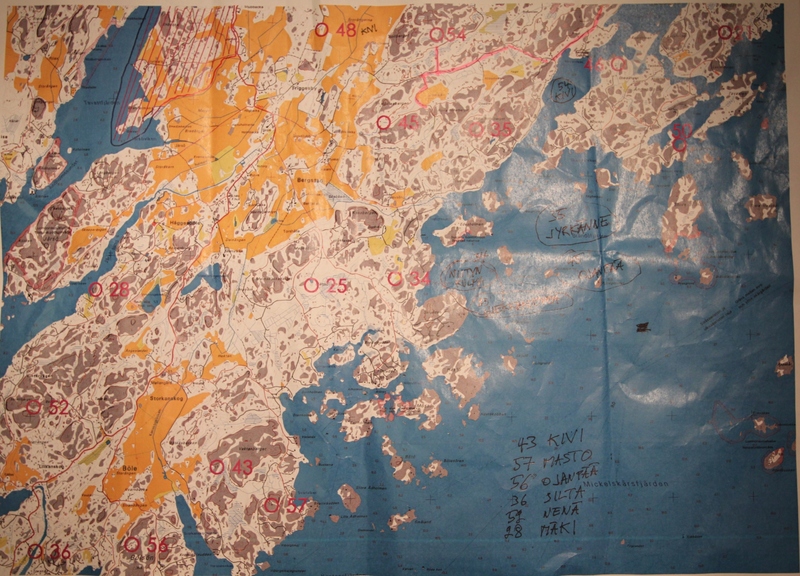 Rogaining is like orienteering with points awarded for each control, with many more controls than an average team can hope to find, and the order in which you visit them is not important. We started at 20:00 in the evening and were using headlamps within about three hours. Most of the crowd seemed to head north, while we headed east to begin with. 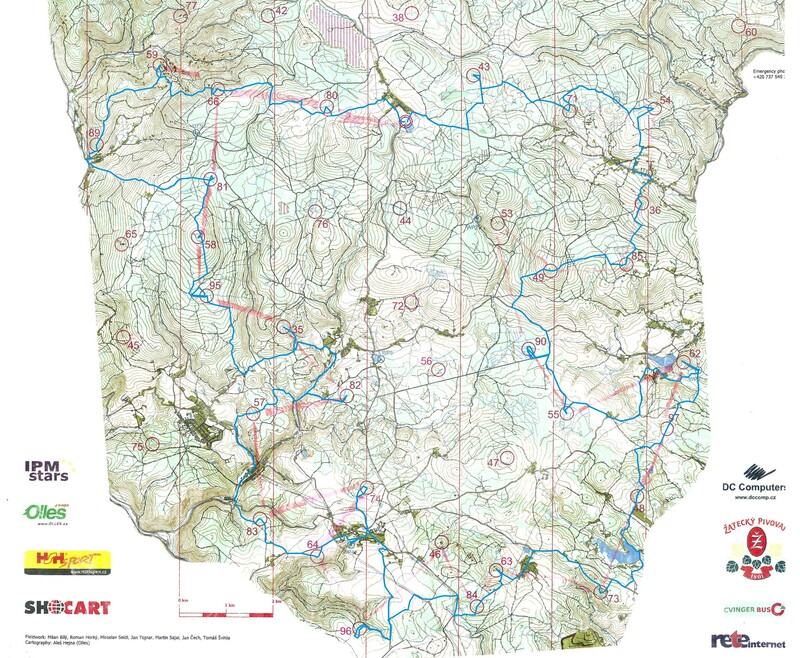 The first few controls were close by roads, and we noticed soon after the first control (km 2-3) that short-cuts through the woods would result in very wet and cold feet. No problems with control nr2 (km 4-5), and a bit of luck at number three (km 6-7) where we walked straight onto the control while passing others who were reading the map carefully and circled around a nearby hill. 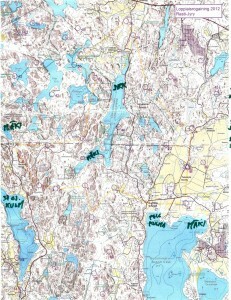 On our map the control was marked on the wrong hill, maybe 200m to the east of its actual location. Everyone got a text message about this at some point. 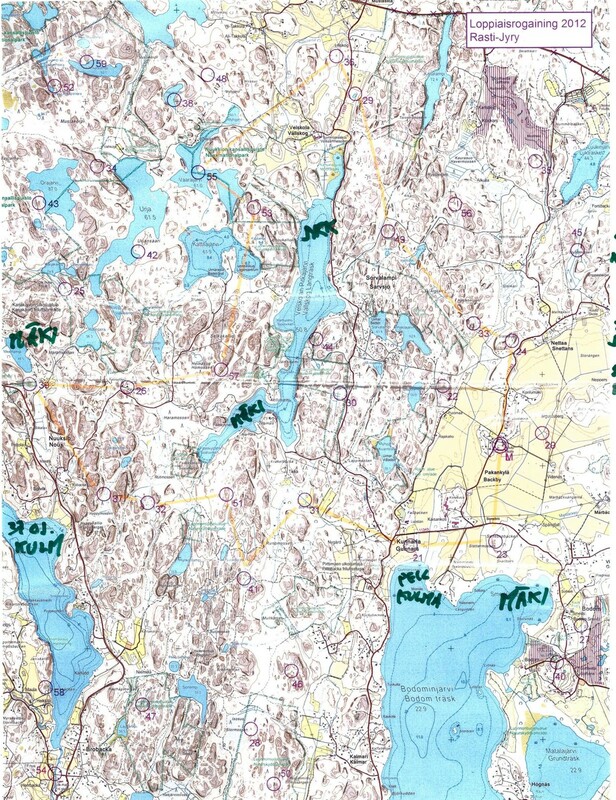 Our fourth control (km 9) was again relatively straightforward, although we were already realising how hard it is to estimate distance on the map without roads, electric wires, or other hard/known reference points. Our fifth control was on top of a hill (km 12), now already in darkness with headlamps and flash-lights. The controls had reflectors on them which at night made them visible from far away if you pointed your light in the right direction. Number six (km 14) was also OK, but again it was difficult to estimate how far we were walking in the woods - walking on the road is so much quicker that it feels like it's taking a very long time to cover a short distance on the map in the woods. Our seventh control (around km 16-17) was only worth 2 points, and we made a bit of a mess of it. Took the road to come as close as possible, and then it was supposed to be mostly open rock until the control. Not so. 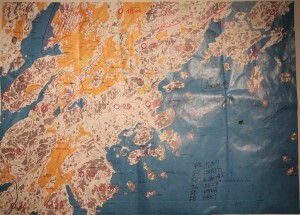 Lots of woods, wet places, and difficult terrain. We weren't the only ones circling around here and others were clearly audible in the quiet of the night as well as visible by their headlamps. After the control we finally found our way back to the small road (km 18) again after abandoning thoughts of finding a 5-point control deeper into the woods and across some really wet terrain. Back at the starting-point we heard that others had searched for an hour or more without finding this 5-pointer, so a reasonable decision to abandon this one. Back on the road again and south. This is where the GPS dies in the picture below. 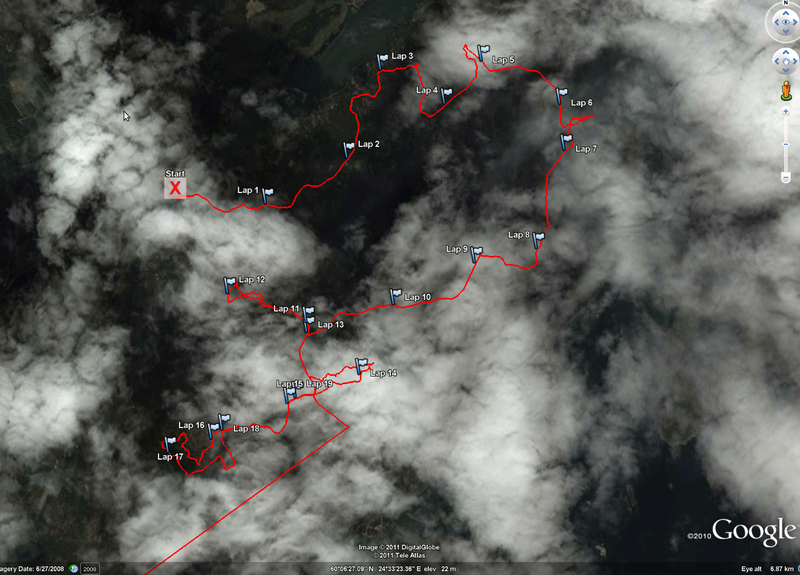 Although the garmin edge 800 is supposed to have a 15 hour battery life, mine gave up after just six, and this is the trace it shows on top of a cloudy google earth map. Followed the road all the way to km 25 to take an easy 4-point control (our eight) close to a small road. Then again walking along roads and edges of fields to control nr 9 (km 29). More roads towards control ten (km 31), and at this point I think everyone started to have tired legs and feet. My legs were tired but not in horrible shape, but some developing blisters in my now soaking wet shoes were more problematic. Northward along a bigger road to control eleven (km 33), which was placed on a small islet in the middle of a pond. The controls had been put out weeks before when the ice and snow still carried the organisers on skis/snow-shoes. Now it was much warmer, damper, and softer. My team mate nearly took an involuntary swim here! Now the day was starting to brighten again and we had about three hours left before our 08:0o morning check-in back at the start. Followed a road towards our second to last control (km 36) at the edge of a field at a stream, then followed the same edge of the field to a path leading to our last control (km 38). Tired but in good spirits we walked back to the start (km 40) and finished with maybe 35-40 min to spare on the time-limit. 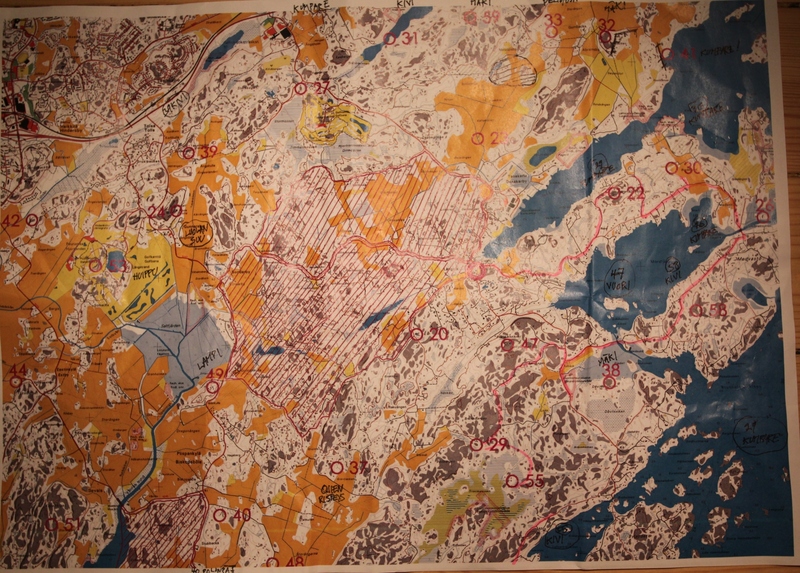 Here are the two A3 size maps we were given. Our route was: start - 22 - 30 - 26 - 58 - 47 - 38 - 29 - 54 - 48 - 40 - 49 - 37 - 20 - start. 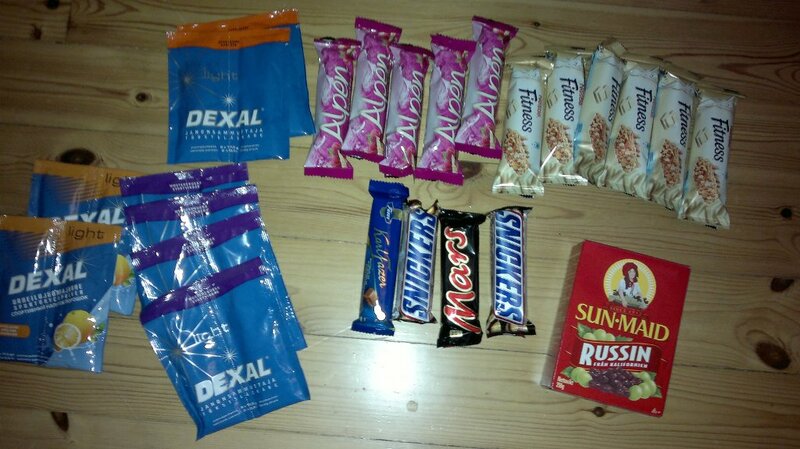 Packing for a 12 h rogaining event. Bananas, sandwiches, sports drink, socks, head-lamp, spare batteries for headlamp, more food and chocolate, toilet paper, pens, ibuprofen, compass, plastic bag for map, heart-rate monitor. 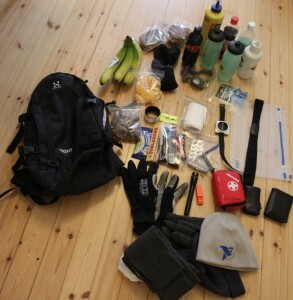 gloves, flash-light, whistle, first-aid kit, keys, wallet, hat (2), gloves (2).